We are among the reputed organizations, deeply engaged in offering an optimum quality range of Designer Wooden Bed. Keeping in sync with the latest market norms and policies, we are indulged in providing a high quality range of Wooden Carved Bed . King Size Bed (Semi carved). 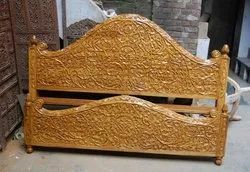 In order to meet excellent quality standards, we are supplying Wooden Carved Bed. 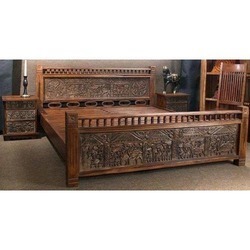 This polished carved wooden bed made from mango wood and exported in the various parts of world is meticulously crafted and designed by our experienced and skilled craftsmen using the latest machines and techniques that gives ethnic look to your bedroom. Head piece: H4'-6" x W6'-4"
Foot piece: H2' x W6'-8"
Night Stand: H1'-9" x D1'-4" x W1'-9"
ZR Furnitures is a manufacturer and retailer of premium solid wood furniture with over two decades of furniture manufacturing experience. We provide a one-stop furniture shopping destination for high quality home furnishing products that are modern with an unrivalled class to your doorstep.